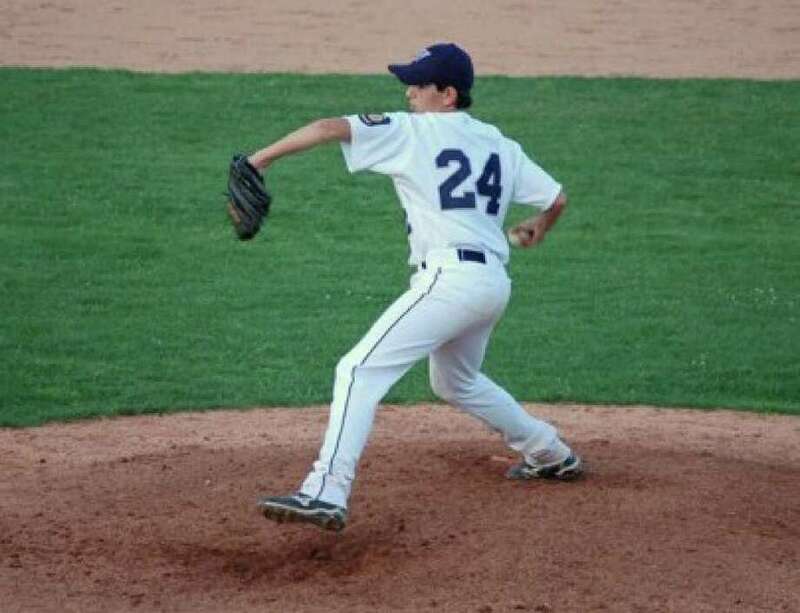 Jonathan Friedman was consistent on the mound for the Westport Junior Legion team this summer. An exciting beginning to the season for the Westport Junior Legions baseball team quickly turned into a bitter disappointment as the team fell from an 11-5 record to end the season 12-15. First year coach Mike Navarro's team appeared destined to move on to the postseason state tournament; as it was in second place in Zone IV and needed to win four of its last 12 games to qualify. The team won only one game for the remainder of the season. "Every way you could lose, we lost," said Navarro. Between hitting, pitching, and defense, Navarro said, "One part of the game was missing each time. We couldn't put together complete games." "Our defense fell apart and we weren't really hitting the ball [in the second half of the season] as well as we were in the first half," said center fielder Nick Kiedaisch. The team could have used Staples juniors Alex Gandolfo and Matt Reynolds, who played for the Senior Legion team. Injuries became a problem later in the season, particularly righty Jimmy Kopack's concussion. The pitcher got hit in the head while on the mound by a baseball thrown from home to second. Navarro saw a few bright spots in what he called an otherwise "disappointing season." Those highlights included the pitcher Kopack, who Navarro called "great all around. He showed a lot of heart and guts this season." Catcher James Frusciante is a developing young talent. "Frusciante had a great year behind the plate," Navarro said. Left fielder Zach Mitchell was another highlight to the team. "Zach did a great job leading off for us and setting the table at the plate," said Navarro. "He put pressure on the defense with his speed." Finally, "Kiedaisch played great in centerfield. And he was aggressive at the plate," Navarro said. While the summer team's success is important, it's also important to improve and develop the players, all but one of who will play for Staples in the spring. "It's a double-edged sword for us," said Navarro. "We want to win, but we also want the kids to improve and be prepared for the next season and the next level. We taught the kids a lot of little things that they can take with them. Staples is building a nice program as far as tradition. They're a real powerhouse in the FCIAC." The players appreciate of Navarro's assistance in their development. "He knew the game well," said Mitchell. "He did a good job managing the team." "He taught us really well and improved our mechanics. He knew how to coach us well," said Kiedaisch. "He fixed the mounds before every game so that the pitchers could have a better game. That isn't easy to do." Kiedaisch believes he improved very much because of Navarro. "I'm reading balls better and picking up pitches differently. He gave us different little tips on hitting and base running. It made it easier on us."